Well, what is an El Niño? An El Niño is a warming of the Equatorial Pacific waters. Fishermen in South America gave it the name El Niño because the waters would get warm around Christmas time and the fish would disappear. These days, everybody seems to be talking about it. You can’t pick up a paper or turn on the news without seeing a story. In fact, as I was writing this, an old friend at CBS was doing a piece on it for Sunday Morning. Clearly, El Niño is already a headline maker, and it hasn’t yet kicked into full throttle. NASA climatologist Bill Patzert at the Jet Propulsion Lab in California has likened this one to one of the all-time greatest monsters, “It’s truly the Godzilla El Niño,” Patzert told me. If it is not the most powerful yet, he believes it soon will be based on the satellite images and data he’s analyzing. And, this El Niño may have played a role in the recent deadly tornadoes in the South and the short sleeve and shorts winter weather in the Northeast. So why so much interest now? In a word: worry. Really intense El Niño events seem to take place about every 15 years give or take: 1982-83, 1997-98, which is the strongest to date. They have profound impacts on the weather, flooding and mudslides in California; wet, turbulent weather in Texas and along the Gulf Coast; and warm conditions in the Northeast. “So all the pieces on the weather board are rearranged and there’s a lot of volatility not just in the U.S. but across the planet,” according to Patzert. That volatility left 42 people dead and 260 injured in Central Florida in February 1998. Seven tornadoes touched down overnight during the worst outbreak ever in the state. Frankly, it really does not matter where this occurrence of El Niño lands in the power rankings. It’s all about when the dust settles, how bad was it? We’ve already seen the first glimpses. And even though the sample size is small, there’s enough historical data, scientists say, to tell us we need to be prepared. There’s still time to get prepared, but don’t put it off any longer. Start by making sure you have a NOAA weather radio, plus a smartphone app like FLASH Weather Alerts that includes “follow me” technology and text-to-speech alerting. You can select alerts for all the different weather hazards, including flood, freeze, and tornadoes. If you know your area is prone to flooding or mudslides, remember “Turn Around, Don’t Drown”, and never cross a flooded roadway. Keep sandbags on hand, and make sure you have up-to-date flood insurance. Do you have emergency supplies on hand including bottled water? You need to! Have you taken a recent inventory of everything you own? If not, do it now. If you are in a tornado threat area, consider installing a tornado safe room or shelter, but make sure it is either built using FEMA 320 or the ICC 500 standard. For all the misery El Niño can dish out, there are a couple plusses. Scientists say it won’t end the drought in California but it should make a dent, and a warm winter saves the U.S. billions in heating costs. The experts believe this El Niño will likely last into the late spring and could linger into early summer. What comes next? Halpert says, “It’s a good bet that when this El Niño ends the next thing we have will be a La Niña.” During a La Niña, the waters in the Pacific cool off, and the weather patterns change. Where El Niño events put a lid on Atlantic Hurricanes, La Niña’s are like muscle milk to Atlantic storms! Hurricane Season could become interesting. Which Tornado Safe Room is Right for You? 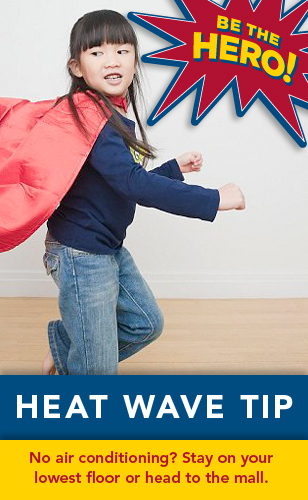 When the air conditioning is out, stay on your lowest floor or head to the mall. For information on protecting your home from severe weather, visit www.flash.org. For mobile heat advisories and safety tips, download FLASH Weather Alerts at www.flashweatheralerts.org.